create the opportunity for your business or organization to showcase its talents. 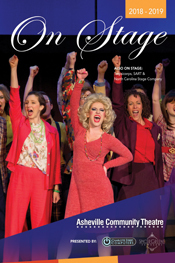 Through their joint playbill publication of On Stage, you can now reach WNC’s largest combined cultural audience, through over 50 performances, with one advertising package. Forty thousand patrons of the arts are waiting to discover your business products and services and to see your company shine through its support of the arts. Asheville Community Theatre, North Carolina Stage Company, and Terpsicorps Theatre of Dance are dedicated to enriching our community’s cultural life, including the education of our future theatre attendees, our children. By sharing the stage with these vital organizations and a host of outstanding area businesses, your company will enjoy the rewards of increased market exposure while ensuring the future of art and creativity for all our community.